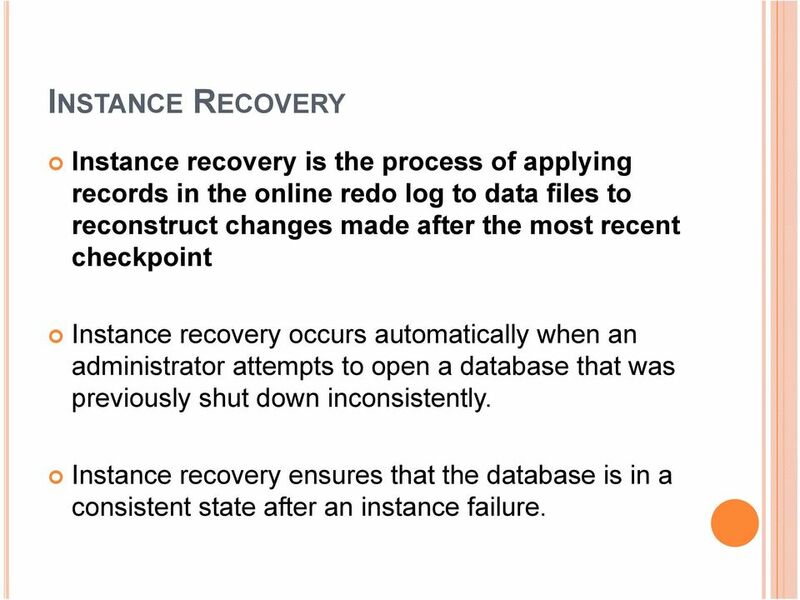 15 INSTANCE RECOVERY Instance recovery is the process of applying records in the online redo log to data files to reconstruct changes made after the most recent checkpoint Instance recovery occurs automatically when an administrator attempts to open a database that was previously shut down inconsistently. 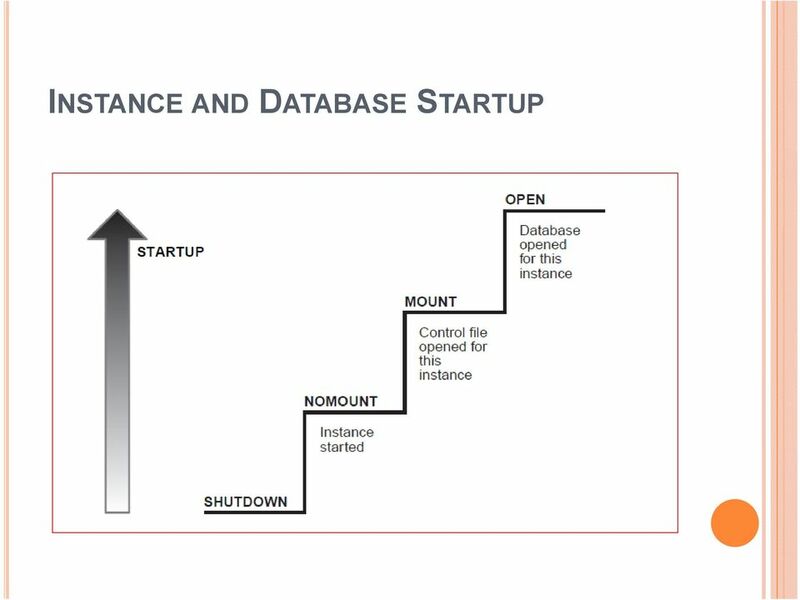 Instance recovery ensures that the database is in a consistent state after an instance failure. 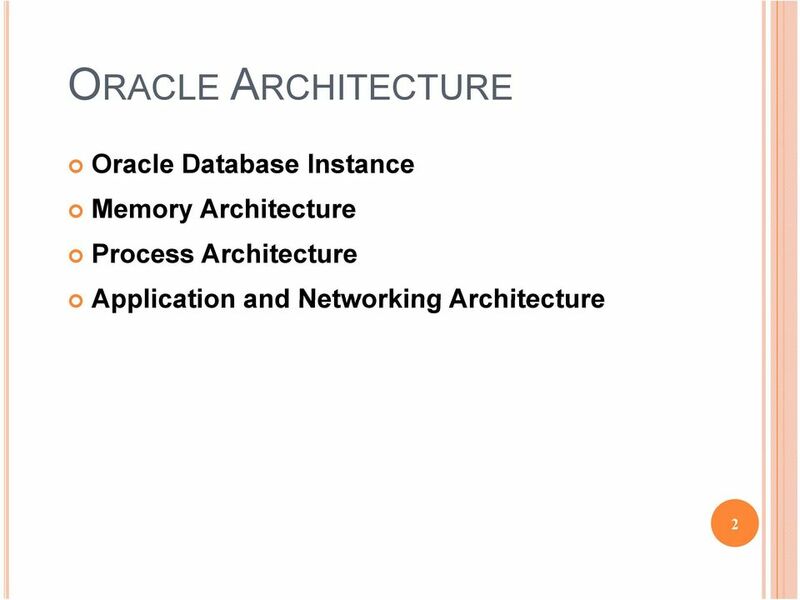 22 BASIC MEMORY STRUCTURES System global l area (SGA) The SGA is a group of shared memory structures, known as SGA components, that contain data and control information for one Oracle Database instance Program global area (PGA) A PGA is a nonshared memory region that contains data and control information exclusively for use by an Oracle process User Global Area (UGA) The UGA is memory associated with a user session. 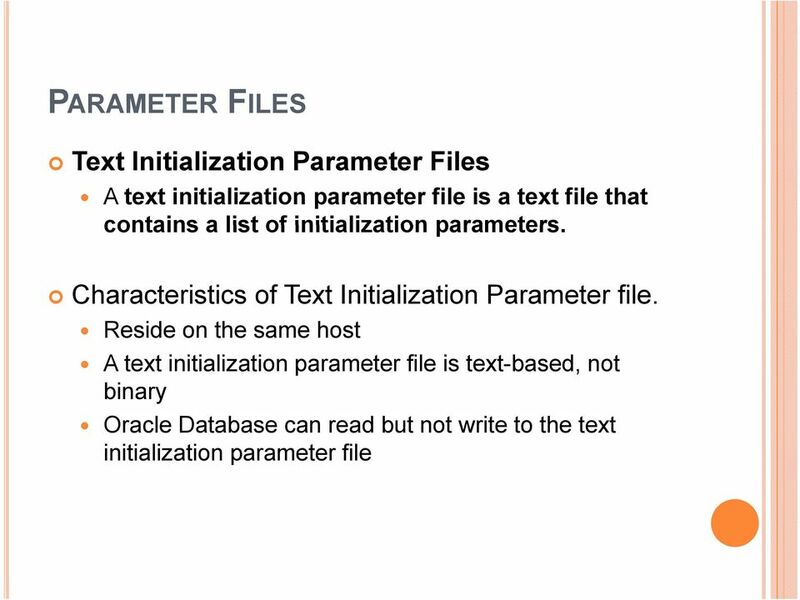 Software code areas Software code areas are portions of memory used to store code that is being run or can be run. 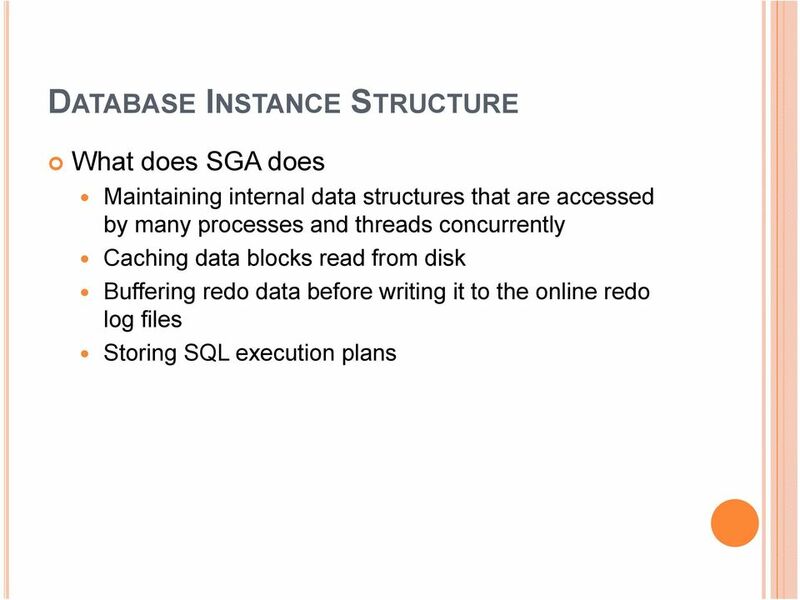 23 DATABASE MEMORY MANAGEMENT Memory management involves maintaining optimal sizes for the Oracle instance memory structures as demands on the database change Automatic memory management Automatic shared memory management Partially automated Manual memory management Instead of setting the total memory size individually set SGA and PGA memmory. 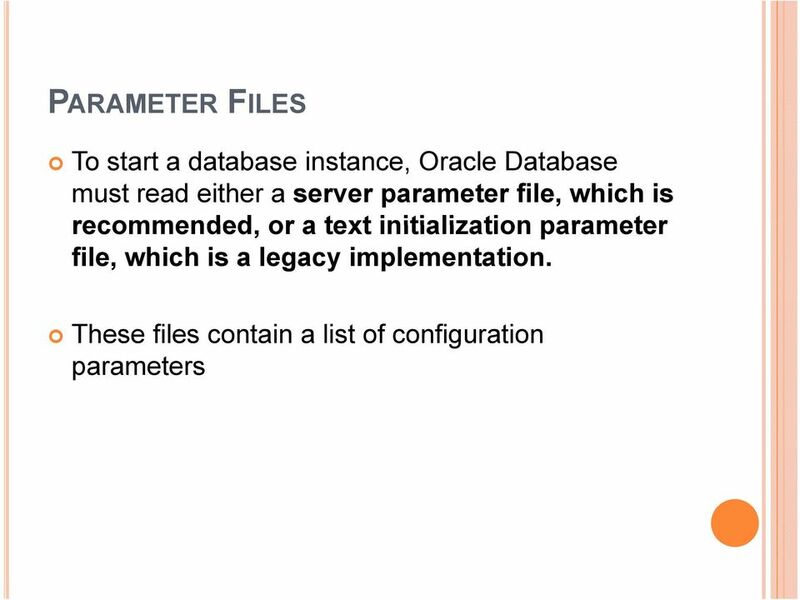 24 USER GLOBAL AREA The UGA is session memory Memory allocated for session variables logon information P/L SQL Package State. 25 PROGRAM GLOBAL AREA The PGA is memory specific to an operating process or thread that is not shared by other processes or threads on the system PGA is process specific it is never allocated in the PGA is process-specific, it is never allocated in the SGA. 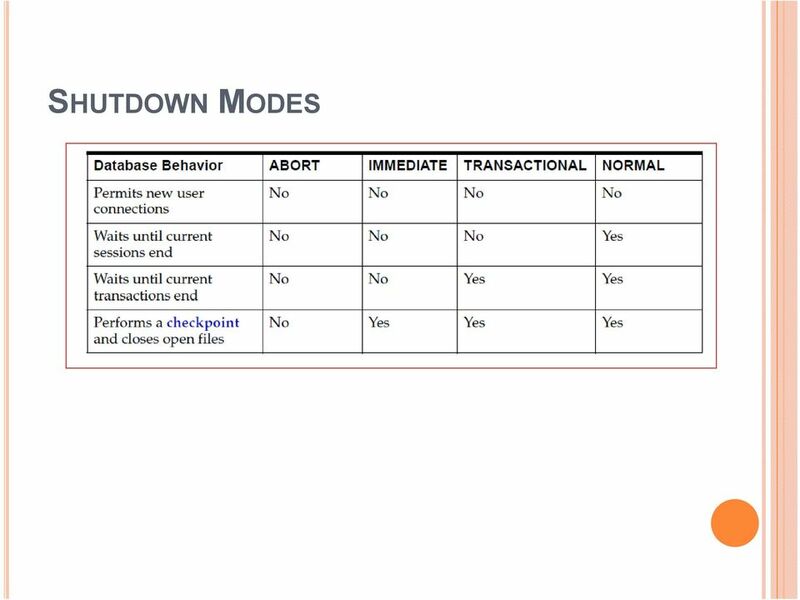 27 CONTENTS OF THE PGA Private SQL Area The run-time area This area contains query execution state information The persistent area This area contains variable values A variable value is supplied to a SQL statement at run time when the statement is executed SQL Work Areas A work area is a private allocation of PGA memory used for memory-intensive operations. 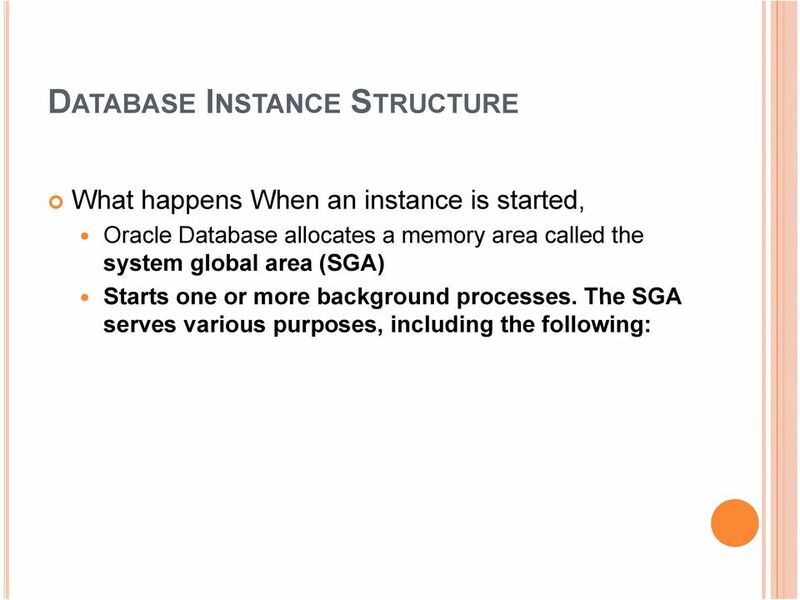 28 SYSTEM GLOBAL AREA The SGA is a read/write memory area that, along with the Oracle background processes, make up a database instance All server processes that execute on behalf of users can read information in the instance SGA Each database instance has its own SGA. 34 REDO LOG BUFFER The redo log buffer is a circular buffer in the SGA that stores redo entries describing changes made to the database. Redo entries contain the information necessary to reconstruct, or redo, changes made to the database by DML or DDL operations. 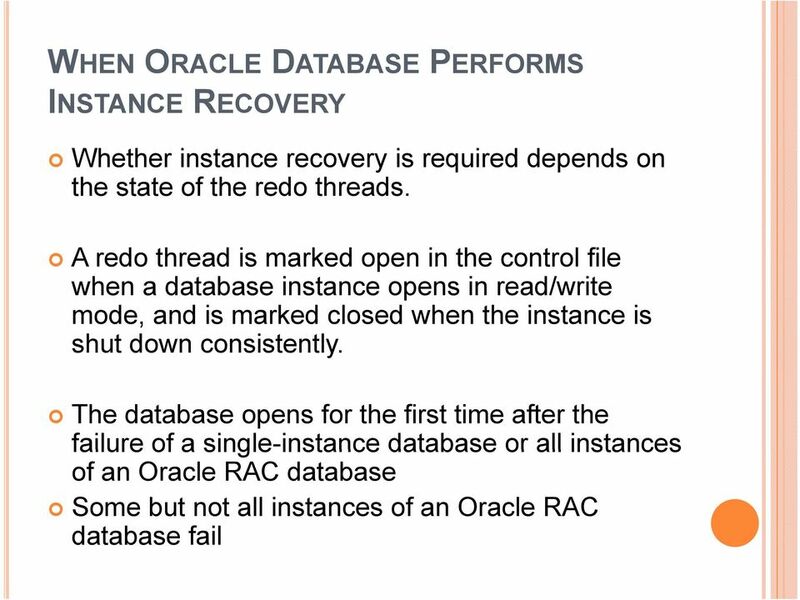 Database recovery applies redo entries to data files Database recovery applies redo entries to data files to reconstruct lost changes. 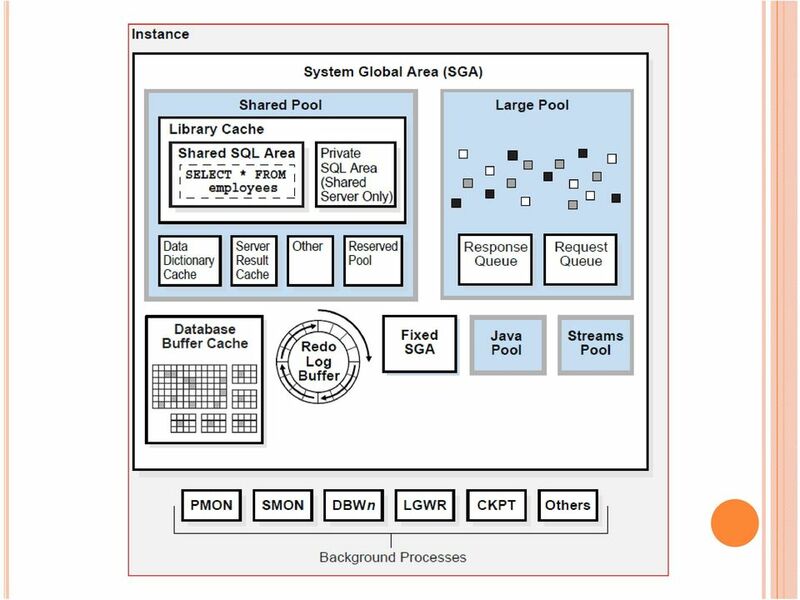 36 SHARED POOL The shared pool caches various types of program data Parsed SQL/PLSQL System Parameters Data dictionary Information. 38 JAVA POOL The Java pool is an area of memory that stores all session-specific Java code and data within the Java Virtual Machine (JVM). 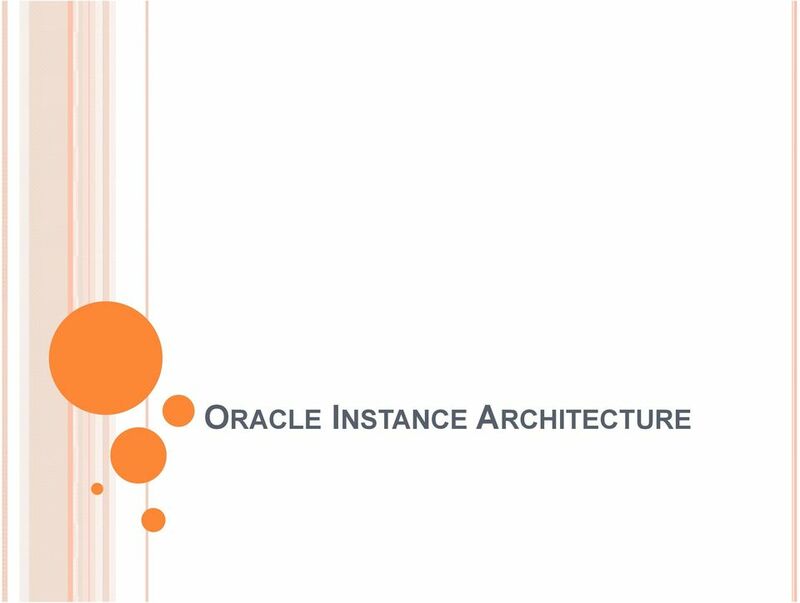 44 CLIENT PROCESSES When a user runs an application such as a Pro*C program or SQL*Plus, the operating system creates a client process (sometimes called a user process) to run the user application. 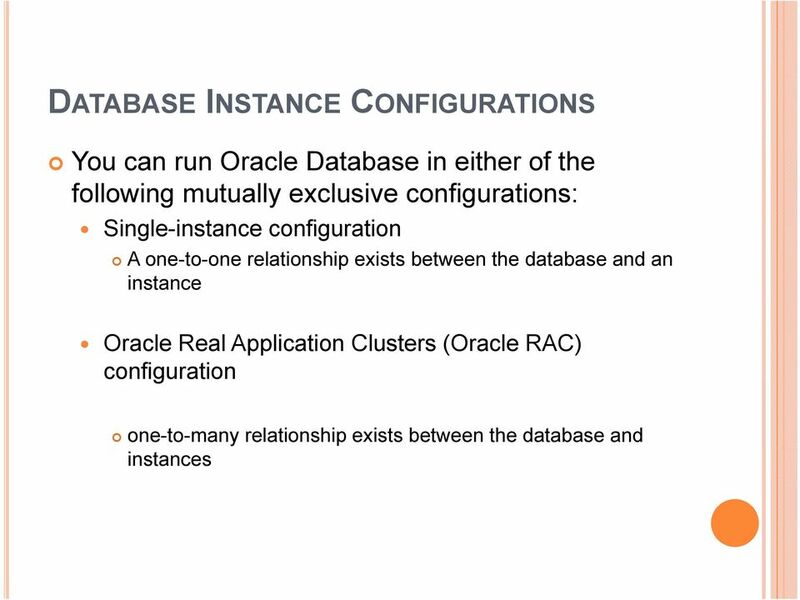 The client application has Oracle Database libraries linked into it that provide the APIs required to communicate with the database. 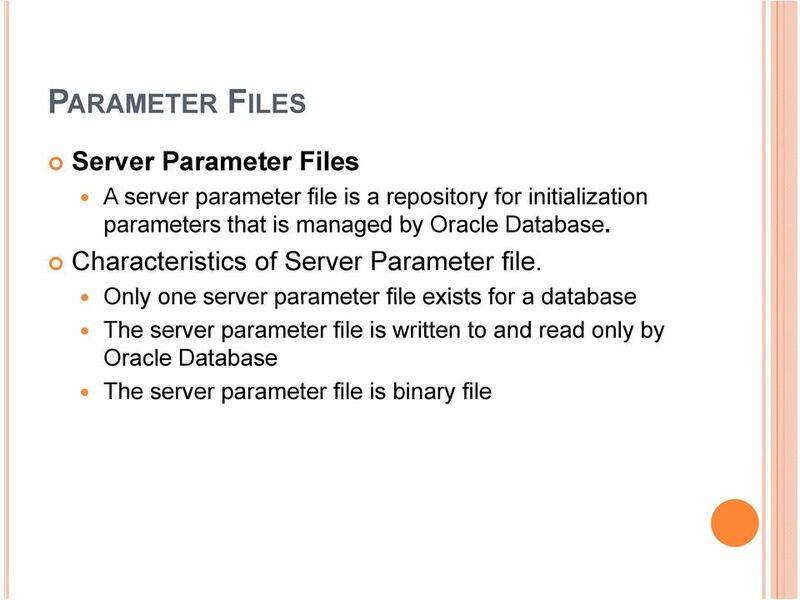 48 SERVER PROCESSES Oracle Database creates server processes to handle the requests of client processes connected to the instance A client process always communicates with a database through a separate server process. 49 DEDICATED SERVER PROCESSES In dedicated server connections, the client connection is associated with one and only one server process Each client process communicates directly with its server process This server process is dedicated to its client process for the duration of the session. 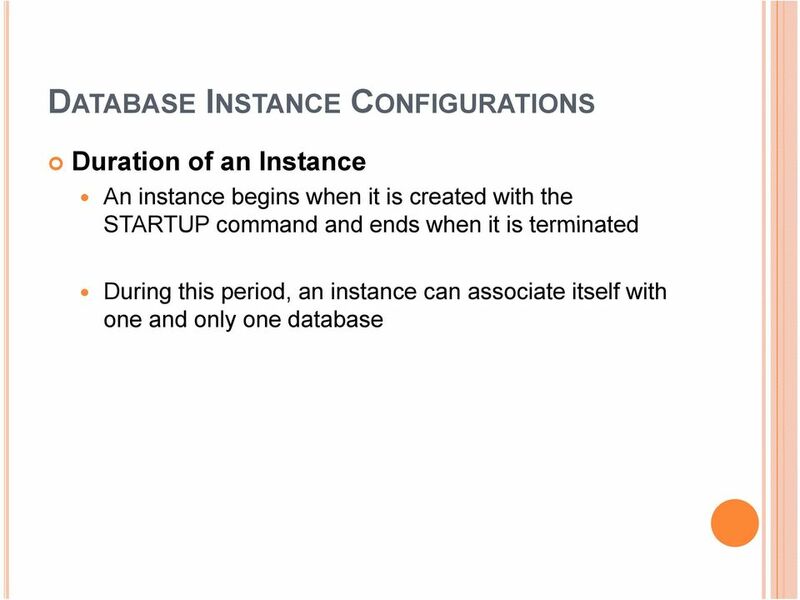 Configuring Backup Settings. 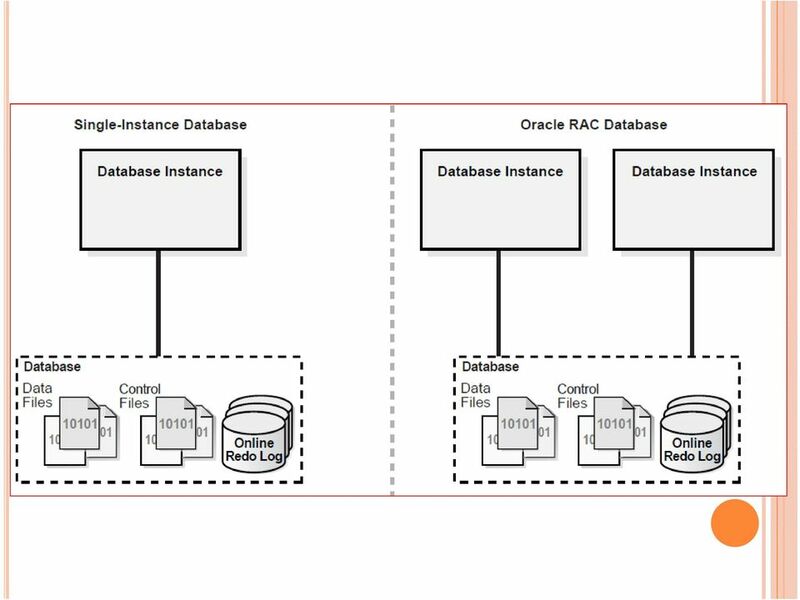 Copyright 2009, Oracle. All rights reserved. Expert Oracle. 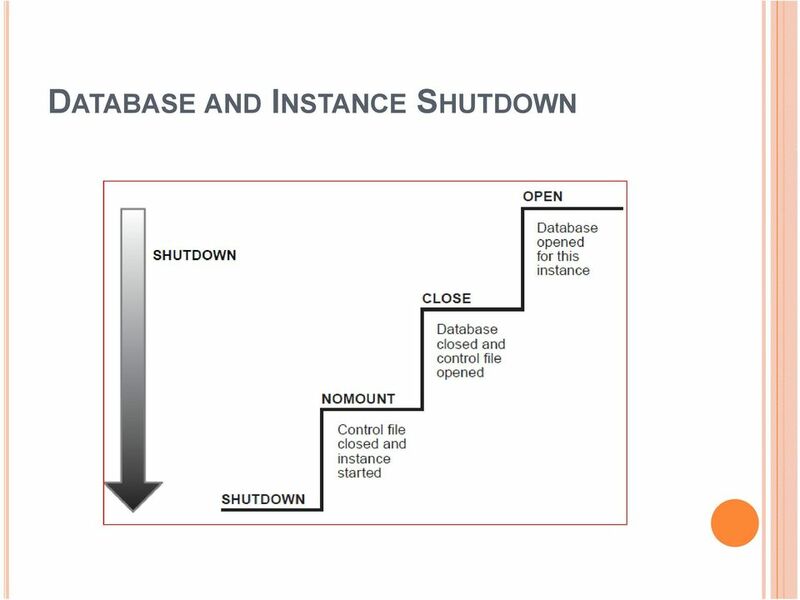 Database Architecture. Techniques and Solutions. 10gr, and 11g Programming. 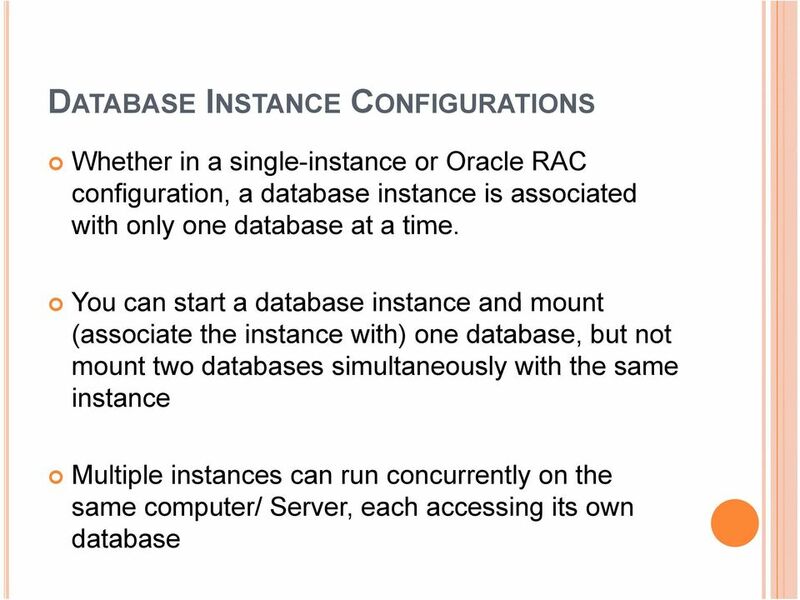 Oracle Database 9/, Second Edition. 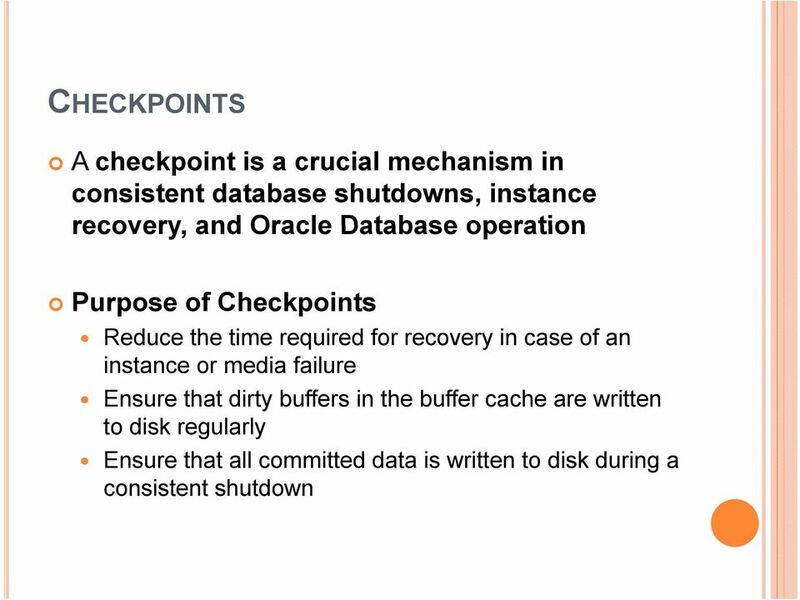 Restore and Recovery Tasks. 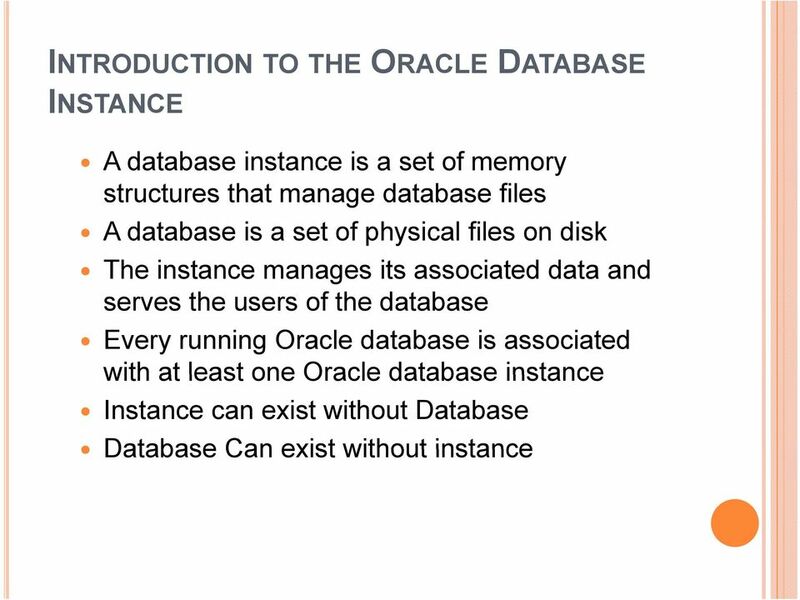 Copyright 2009, Oracle. All rights reserved. 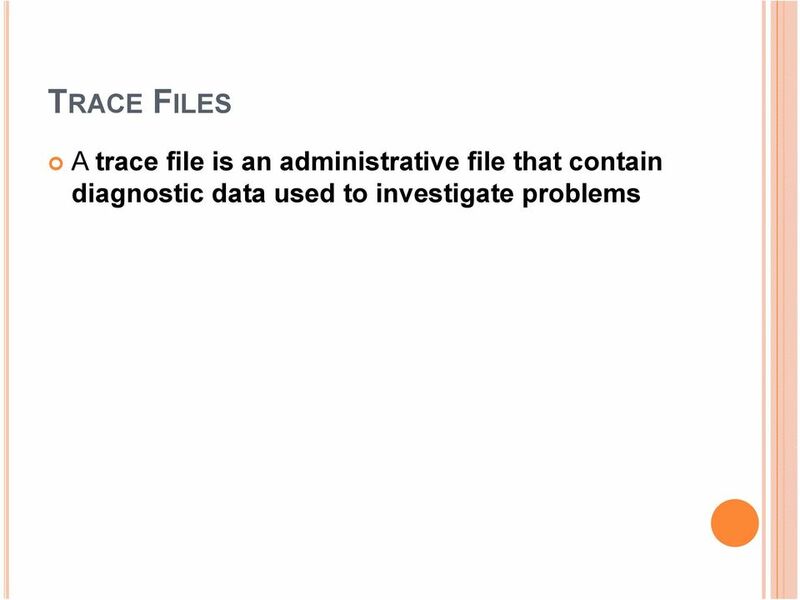 1 of 5 1/17/2015 1:28 PM ORACLE DATABASE ADMINISTRATOR RESUME ORACLE DBA Resumes Please note that this is a not a Job Board - We are an I.T Staffing Company and we provide candidates on a Contract basis.